its grete product…. I unable to express my feeling in words because I personaly impress so much with this product. you unable to feel until you really use it. Great shampoo with fresh subtle scent. Left my hair feeling wonderfully shiny. I will recommend this shampoo and conditioner to those I know. Free of chemicals common in store-brand hair products (for example, sulphates and formaldehyde), Nature’s Aid shampoo and conditioner both cleanses and hydrates the hair without leaving behind a film (like some all natural hair products do). 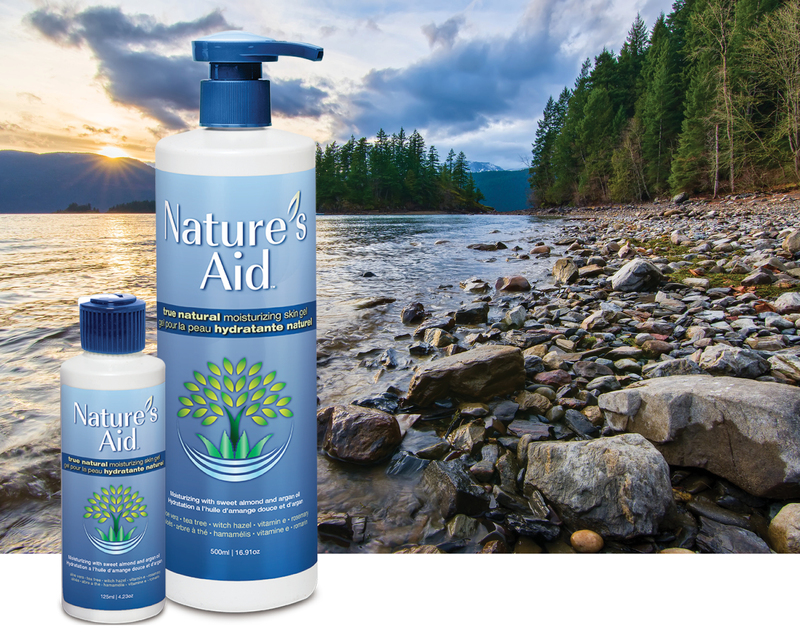 Nature’s Aid shampoo and conditioner also has a light, relaxing fragrance. I will be repurchasing this product and I would definitely recommend it. I love this skin gel! We used it on scrapes, eczema, blemishes, rashes … it is unscented and all of the ingredients are time-tested necessities in one’s home first aid kit (witch hazel is cooling, aloe vera is healing, tea tree oil is antiseptic, vitamin E is soothing and rosemary is antioxidant). Because it’s not greasy, it’s quickly absorbed and doesn’t leave a slimy feeling. This product will be a must-have in my handbag and first aid kit. I like the non greasy feeling of this gel. I have used it on my paper cuts and they heal quite fast. I also use it as my daily moisturizer. Since it contains all natural ingredients, I feel safe to use it on my sensitive skin. Overall, it is a great product to have in your purse and it comes in travel sizes too. I have been using the skin gel for awhile now and quite like it. I tried it as a toner, on eczema, first aid for a cat bite and even for really bad diaper rash. I love how it dries quickly and you can’t feel it on the skin. Helped bring down swelling and soothed the skin. It’s filled with ingredients I was confident putting on my skin as well as my children’s. I also fell in love with the lip balm and have been raving about it since trying it. I have recommended this product and will be purchasing in the future. I like the smell and feel. I used it on my body rather than my face and have no complaints. I’m an esthetician who abstains from parabens. I was happy to see that this product doesn’t have them. Will be purchasing when I run out. I loved this product! I used it on blemishes, cuts and scrapes, and as a facial toner as well. It was fantastic! I cannot wait until summer to use it as a sunburn relief product! What a great product! I used it as a facial lotion for my combination/sensitive skin without suffering any irritation. Those with drier skin would want to use a moisturizer over top. I was most impressed by how quickly it cleared up a skin rash that my dog had. I noticed a remarkable improvement within 24 hours. Definitely going to be an essential product in my natural healthcare repertoire. I really enjoy this product. I often use it after outdoor activities since west coast has very HOT day. I put it in my fridge and then put on sunburn area, after few minutes it would be cool down very quickly and feel comfortable again.